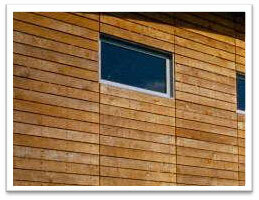 A wood's natural colour can be stimulated by surface coatings that come in either transparent or translucent form. Opaque finishes are available in a range of colours so that they can be pasted onto more muted colours. If you don’t have these coatings then being exposed to moisture and UV light will bleach the wood to a grey colour, this exposure (particularly on softwoods) may result in the friability of the surface. Due to these factors softwood needs to be coated as soon as possible so that you get the best performance possible from the coating system whereas with hardwood you don't particularly need to coat it because hardwood can be used "green" (without any coating). You need to take into account that if you have a clear finish then the wood has a limited maintenance free life as well as little protection against UV light. A pigment needs to be included into the surface protection whether it’s translucent or opaque (opaque provides better protection) to help stop ultraviolet degradation. Dark colours will protect against UV but they do leave wood vulnerable due to the temperatures generated when exposed to the sun. This will lead to cracking in some woods due to the lack of moisture in the wood. It is advisable when using a coating system to apply one finish coat before fixing to all faces. This means that uncoated surfaces will not be exposed in the event of shrinking, but moisture loss and gain is likely to be consistent over all of the pieces of wood. The coating system that you use needs to be extensible and permeable to moisture vapour. Traditional coating agents such as solvent-borne paints, stains and varnishes are so brittle that they can’t follow moisture movement of the wood, this will cause cracking. Through these solvents being less vapour permeable, moisture can become trapped behind the coating and this will cause all manner of problems like blistering, flaking and peeling of the finish. Micro-porous finishes are flexible enough to follow moisture movement and are permeable enough to stop the build up of water in the wood. When applied in controlled conditions in a factory, modern finishes can extend the maintenance period significantly. When applied on site coating a system can deteriorate down to the wood already being exposed to moisture and UV light, as well as the possibility of more dirt and construction dust. Moisture cannot be controlled on site meaning that you can’t guarantee getting a suitable application, also the quality of workmanship is not always reliable. Base coats provide little protection against moisture and UV light even when applied in a factory. Once deterioration has begun you MUST recoat as soon as possible, before the bare wood becomes exposed. This is because if it gets this bad then the next coat will not be as effective as the first so you will need further maintenance to protect the wood if it becomes damaged. When this happen to softwood the damage is worse from UV light than on hardwood because of the soft surface, however base coats and finishes won’t last as long on hardwood because it is harder for the pigments to penetrate the denser wood.